In winter they came on Snowshoes. �But before long a few started to bring Skis. 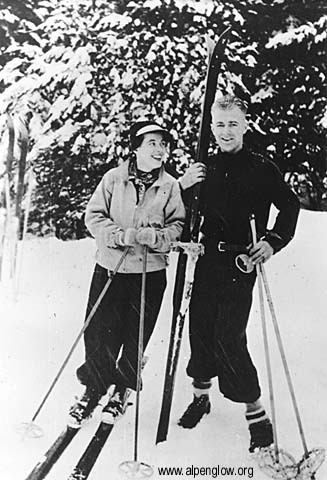 �The Mountaineers found skis to be Good and began using them to explore both north and south from their Lodge. �In 1928, a band of Mountaineers spent a weekend in railroad shacks near the Stampede Tunnel to see if this country might rival their home skiing grounds at Snoqualmie. �They liked what they found and before the year had ended they built another home, the Meany Ski Hut, near the Stampede Tunnel. Adventurous Mountaineers soon scouted an eighteen-mile ski route between their two mountain homes. �In 1930, they inaugurated a race over this route, the Patrol Race. �This race was the first of its kind in North America. �Three-man teams would start at intervals from the Snoqualmie Lodge over a trail broken by a party that left before dawn. �Each man was required to carry a ten-pound pack of emergency provisions and the three team members had to finish within a minute of each other at the Meany Ski Hut. �The race ran for twelve years and produced tales of both misadventure and great skimanship. During World War II, the race was discontinued and in 1944 the Snoqualmie Lodge burned to the ground. �Travel by railroad was supplanted by the automobile, large sections of the Cascade crest between Snoqualmie and Stampede Passes were clear-cut, and skiers turned to groomed trails, chairlifts and slalom. �The Patrol Race passed out of memory for all but a few old-time skiers. A few years ago, as I started researching Washington ski history, I read many stories about the Patrol Race. �During the winter of 2001, when a low snowpack created poor skiing, I scouted the route from both ends on consecutive weekends. �A few weeks later, on a cold, foggy day, I skied the route end-to-end. �The following winter I skied it again. �I wanted to share the experience of skiing this route with a partner, but due to low interest, schedule conflicts, or bad weather I never hooked up with anybody. Last Friday I posted a note on turns-all-year.com looking for someone to ski the route on Sunday. �John Mauro called me up. �I was a bit nervous about trying the route with an unknown partner, but John came recommended by someone I trust and he enjoys covering distance on skis as much as making turns, a rare quality these days. �We hit it off right away. We parked my car at Snoqualmie Summit and started up the groomed slope in the dark at 6 a.m. �By the time we reached Beaver Lake, it was getting just light enough to venture into the woods without headlamps. �We carefully descended crusty snow to Lodge Lake, the original start of the route. �Then we traversed southward, pausing for a moment above the Snoqualmie Tunnel to imagine the Mountaineers, almost ninety years ago, disembarking from the train to begin their hike through the snow to their Lodge. We followed the Hyak cross-country trails to Windy Pass, then entered the woods northeast of Silver Peak. �The section from Windy Pass to Tinkham Pass is my favorite of the route. �The old forest is still intact, making it easy to imagine what the entire route was like in the old days. �It is also possible to find some of the original route markers, orange colored tin shingles (like large mailbox flags) nailed high on the sides of trees. �In April 1933, a party of nine Mountaineers placed over five hundred markers, every three hundred feet or so, along the length of the route so at least one marker in each direction was visible at all times. �South of Tinkham Peak, most of the markers were cut down with the great trees that supported them, but north of the peak a few remain. We reached Tinkham Pass (northeast of the peak) at 10 a.m., a little behind my previous pace due to harder trailbreaking and stops to take pictures of the markers. �Then we descended to Mirror Lake, where we encountered our first snowmobile tracks. �Except for the tracks, Mirror Lake would have looked unchanged to the pioneers. �But once we passed through the trees at the outlet of the lake we entered the Desolation of late twentieth century forestry. �As far as the eye could see there were clearcuts and logging roads. We descended to Yakima Pass, then skinned up the clear-cut shoulder south of Twilight Lake to the main Meadow Creek road. �All the roads were packed by snowmobiles, and we gave friendly waves whenever they passed us. �We schussed down the road for two effortless miles, then took a spur leading up Dandy Creek to a pass one mile northeast of Dandy Pass, known in the old days as Baldy Pass. �Here we could look north along Keechelus Lake and see how far we had come. �From Baldy Pass we followed the Pacific Crest Trail to Stampede Pass, then followed roads and power lines to the Meany Ski Hut, arriving at 2:30 p.m.
Our time from Snoqualmie Summit to Meany was 8-1/2 hours. �For comparison, the record time for the Patrol Race starting at Lodge Lake--about 45 minutes into our tour--by Wolf Bauer, Chester Higman and Bill Miller in 1936 was 4 hours, 37 minutes. �Those were rugged days! At Meany we were welcomed by the Mountaineers, who have been operating their little ski area at this site for seventy-five years. �The area is a throw-back, a time warp, and thoroughly charming. �We rested in the old hut, then accepted a tow behind their tempermental old snowcat to the highway. �The Age of the Railroads that gave birth to skiing in the Northwest is long gone, but as John and I bumped along with fifty other skiers behind the old cat, it seemed to me that in this tiny corner of the Cascades the old ski trains are still running. Wow.... those guys were obviously serious hard men! I say that because I remember how fast Lowell was at the randonee race at Alpental. Did they travel on skins, or just run up the peaks? That kind of time boggles my mind. Wonderful reading, history and an inspirational tour. Reminds me of the the Commando Run in Colorado, although a finish of 3,000+ vertical to the base of Vail is a bit different than a cruise to the Meanie hut! Thanks for the history lesson, Lowell. Always an interesting read. It's great to hear the day worked out well. Wow.... those guys were obviously serious hard men! �Did they travel on skins, or just run up the peaks? You had some good weather for your tour Lowell - I was participating in my son's Birthday Party on Sunday but at least I got to ski since the party was at Alpental! I was tempted by your earlier partner request - maybe next year? A time of 4:37 is certainly fast, especially considering the fact that it is hard to wax for our typically wet snow. Compared to AT gear though the light nordic stuff excells in mild terrain (lighter, longer stride, glide on low angle climbs...). I have skated the Mt Catherine Loop in under an hour and it takes me around 1:40 on my snowfields/europas (and there's alot of faster nordic guys out there!) but that is not a good guage since it is all groomed but it is 15 k and does have some hills. Lowell, you are certainly a rare treasure for us all here in the PNW. Thanks for all your work.